Bob: Did you see my replies on the other threads over at WattsUp? Hi RichardLH. Yup. I noticed them. But, as I’ve mentioned before, I don’t have the time to study something new to me at this time. That’s OK. Should be fun watching what happens – if anything. RichardLH: Consider opening your own blog through WordPress or Google so that you can provide more detail about what you’re showing. I have tried to avoid that as I know and appreciate just how much time and effort hosting a blog takes. I remember, back in the day. running FAQs and bulletin boards took way too much of my time. Fun but very time consumming. All I have done is taken the dust off an old analogue audio/rf circuit (which is well known and understood) and applied it to the digital world (and Climate Science). I didn’t know that was what I was building when I started out, but once I saw clearly what I was doing, it allowed me to be then confident in what it was showing me. Noise is always a problem in signal work. And fundamental frequencies. Need to get rid of both wiithout destroying what is left. This does that with surgical precision. The rest is just exuberance and adrenaline I’m afraid. If I had understood what I was doing at the start this would all have been much more coherent. With your permission (please delete if you do not wish to do so) I will post here what I have posted elsewhere as regards the tool and what it is/does. 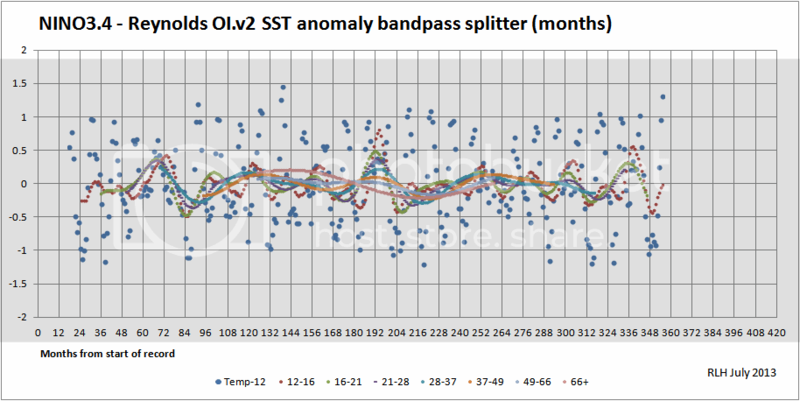 Ideal digital sampling series for a bandpass splitter in Climate research. next = rounded(previous*1.3371) starting from 3 or 1. It precisely ‘nulls’ the 12 month signal whilst leaving all of its harmonics and all other frequencies intact. This is a digital implementation of a ‘brick wall’ cascaded low pass/bandpass splitter circuit (approx 1/3rd octave). As it is a digital average, it has a ‘square wave’ sampling methodology on the source data. The well known side effects of this ‘square wave’ sampling are cancelled out by using the 1.3371 inter-stage multiplier. On the plus side, it has a infinite(?) roll off per octave between stages so the bands are precise, though not tunable. Also, as it is completely de-tuned in the passbands, it is completely insensitive to internal data distribution ‘in band’. On the digital side, this is just the well known 3 pole filter arrangement which running means require, extended to the full cascaded filter set. It can be used on either normalised (at 12 months) or non-normalised data. When used as a simple 3 stage filter on daily data it can provide a 28 day smooth which is more scientifically accurate than a human Monthly one. When looking at temperature data, this series and circuit should be used rather than Normals of any period. 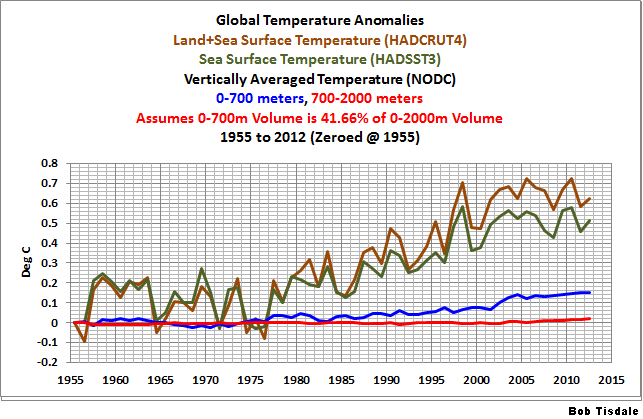 Because of the 4 year period it discovers in temperature series, Yearly Normals should be discarded. When used in Splitter mode (each stage subracted from the previous stage) it provides a ‘DC’/zero referenced view of each passband. 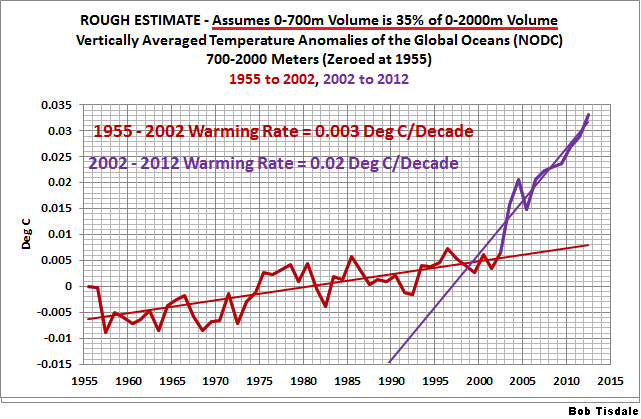 The final stage can be set to ‘DC’/zero or a ramp as required for any very long term trends (such as CO2). Nodes can be extracted by using, -previous*next between each stage, or other such similar arrangements. RMS power can be extracted from each passband in the normal way. The maximum period that can be discovered by this method is limited by the record length and this is a power series. Getting very long cycles will require correspondingly much longer input data! Also worth noting, the period length limit appears to be the reciprocal of Nyquist as 1/period = frequency. A ‘spreadsheet’ verification model exists as, by definition, the sum of all of the stages outputs will always equal the input. The ‘power’ left to be assigned to any long term, yet to be discovered cycles, ramps or theories, can be determined and/or accounted for. Also very puzzling, Why does 12,28,37 and 48(9) which are the main components of gravity fields here on Earth (i.e. Lateral as well as Vertical tides) show up both in the series and in nature? Co-incidence? With 4 points of match I would have said not. P.S. I always wondered why the Ancients had a 37 month Calendar. I think we should never underestimate the observation powers of the past. Their conculsions maybe, but their observation skills were probably better than ours today – unfortunately. Observation and logic. Skills worth preserving and practicing. And if, from the various displays, you do not think that this ‘proves’ that there is Global Temperature ‘natural regulator’ set at about +-0.1C (which is the range that the various bands are showing as common) and that that might provide a quide as to how many long term cycles are yet to be accounted for if you assume that? QED? Including any long term downward travelling ‘wave’ of temperature into the depths (to bring this all back to the tread – finally – sorry). If the ‘power’ is not there at the extreme end of the frequency bands so far resolved, then there is nothing left to be accounted for! That might be a problem. RichardLH, I enjoy your enthusiasm. But I just wanted to let you know, my traffic here is very small compared to WUWT. And most of the people who visit here are interested in specific items that I address. Unfortunately, what you’re presenting is not one of them. Just thought I should let you know. Again, consider opening your own blog and then working to create traffic. Bob: Again I am sorry. It is just such a new toy. A nice engineering tool. Enthusiasm as you say. Nothing more intended. are you aware of any mechanism that would transport serious amounts of warm water to below the thermocline? I’m asking because I’m convinced that the direct influence of solar warming is restricted to the top ~200m of the oceans. Below the thermocline is no serious warming from above possible imo, only cooling by denser water sinking, mostly at high latitudes. Ben Wouters: For example, consider the Gulf Stream. It’s driven northward by the trade winds in the tropics. But Gulf Stream transport also depends on surface winds at higher latitudes. They can enhance the poleward transport or they can resist it. If the flow from the tropics toward the poles were to remain constant, but the high latitude winds resisted the poleward transport, then the warm water could be forced to greater depths, lets say at mid-latitudes. Thanks for your quick reply Bob. What is the maximum depth (approximately) where these wind effects can still be seen? I’m looking for mechanisms that could warm all of the oceans BELOW the thermocline, let’s say below 1000m by whole degrees. I’m stuck in a discussion because my discussion partners believe that by conduction the deep oceans will warm up to the same temperature as the surface if the cooling at high latitudes wasn’t counteracting this. My position is that there won’t be conduction below the thermocline. This is cross posted from WUWT for the benefit of Ben Wouters @ July 6, 2013 at 10:17 am. 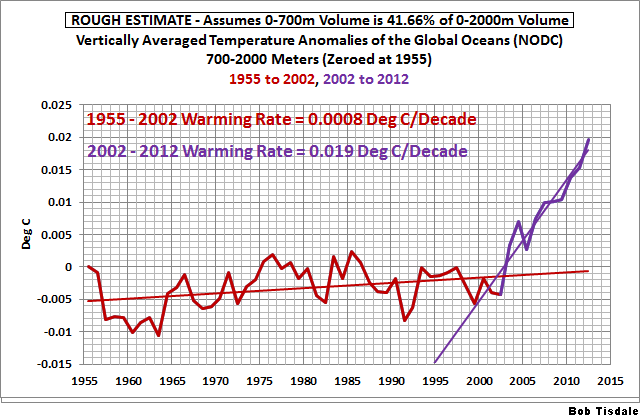 Please stop thinking that the density of seawater is determined solely by temperature. It is not, because seawater contains dissolved salts the degree of salinity also controls seawater density. It is perfectly possible to have a warm dense salty seawater body, such as Mediterranean Bottom Water, capable of sinking below the colder but less dense Atlantic seawater where these two water bodies meet as happens in the Gulf of Cadiz. Meddy image GOLR012. The combination of the dry trade winds, the extensive shallow water platform and the tropical sun means that the Caicos lagoon acts as a giant solar energy collector. In the lagoon, which has an area of some 2,000 sq. km and a water depth of no more than 10 metres, the tropical sun warms the sea water, the dry trade winds enhance evaporation concentrating the seawater and increasing the salt water density. The trade winds then blow this warm dense water across the platform lagoon to the west, where we find the tiny island of West Caicos. 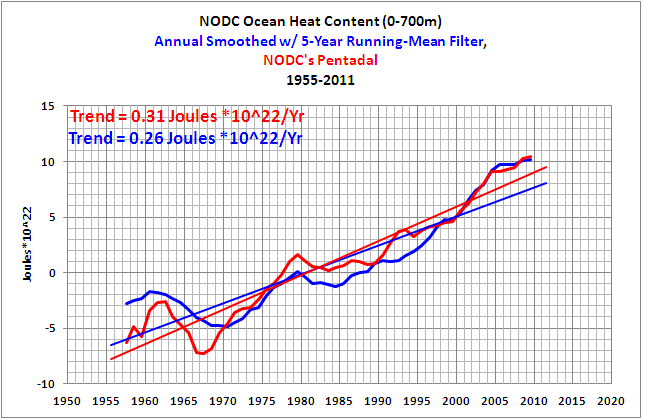 The curious part: Lozier et al (2008) was based on the old NODC ocean heat content data, before they deleted the hump. So the hump was explainable with natural factors, yet it was deleted because the climate models couldn’t reproduce it. thanks for your extensive reply. I have been looking at the THC, and found no indication that it can transport LARGE amounts of warm water to the deep oceans, to the contrary. No high salinity water anywhere in the deep oceans. 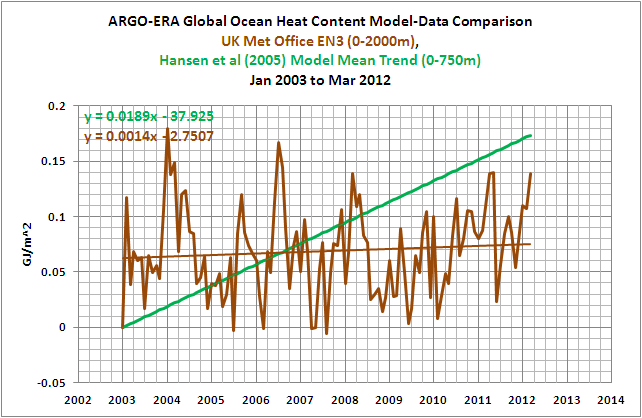 Small scale warming is of course possible, but warming the deep oceans by eg. 15K is not going to happen by the THC imo. Funny that you mention the Cretaceous. I have been looking at that period myself, and I can assure you that the high temperatures of the deep oceans (below 1000m) in that period have nothing to do with the THC. 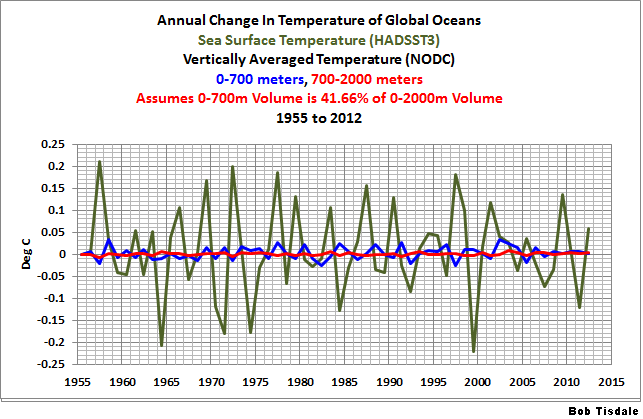 Perhaps a bit of topic, but are you aware of this deep ocean (<1000m) temperature reconstruction? It shows that ~82 mybp the temperature of the deep oceans was ~17K higher than today. 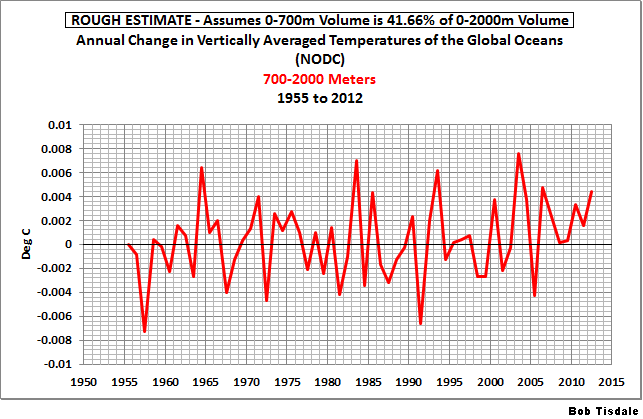 The explanation for these temperatures is embarassingly simple, and has nothing to do with CO2 or a greenhouse effect. Notice that the temperature on average has dropped 1K every ~5 million years, and simply explains why we are in a glacial era today, with alternating ice ages and interglacials. I'd like to discuss my ideas, but they are of topic for this post imo. Perhaps contact me via my provided email address. Ben Wouters: Thanks for the link to the paleo reconstruction. If I may, I’d like to personally bow out of any discussion of paleoclimatological data. Please feel free to provide links for others, but my interest is satellite-era SST data and OHC data for the last 55 years. I get your point, but I’m convinced that to understand our present climate (and the reason our temperatures are so much higher than solar radiation alone can explain) we have to look at the past. 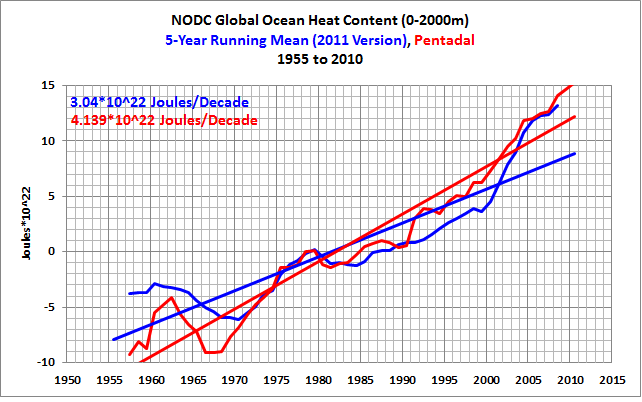 Let me explain: looking at your figure 1 above we see a basically flat temperature for the deep oceans the last 50 years. This is surprising, since the geothermal flux through the crust (~100mW/m^2) is enough to warm ALL ocean water ~0,01K every 50 years. Further we have magma erupting near plate edges, vents etc.etc. So all this warming must be counter balanced by a cooling process. This can only happen at high latitudes, were the surface temperature is equal to the temperature of the deep ocean, and no ice cover prevents this cooling. This whole warming / cooling has been going on for the last ~82 million years, and the deep oceans have lost 17 WHOLE degrees in that period. So whatever caused the warm deep oceans in the first place is a major climate driver, and it has nothing to do with CO2 or other greenhouse gasses. So I’m pretty confident I have a better explanation for our temperatures being above the Effective Temperature of 255K than the greenhouse theory. I’d like to discuss my ideas with someone who has a good understanding of how the oceans work. 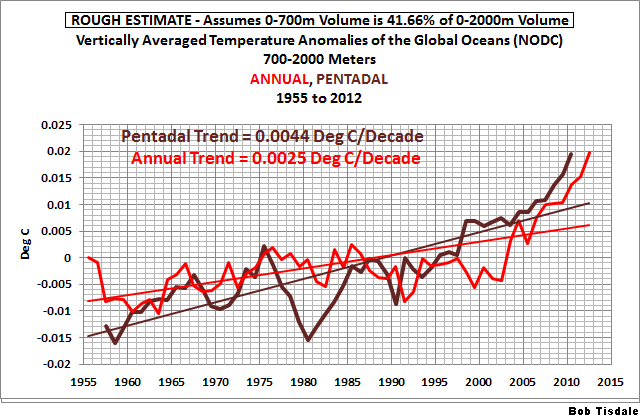 Pingback: If Manmade Greenhouse Gases Are Responsible for the Warming of the Global Oceans… | Watts Up With That? I have just found this article after clicking a few links from WUWT. Any estimate of the error bars associated with the alleged data? I estimate that each argo buoy has to sample about 300,000km3 of sea water so I would love to know what the error bars would look like on the above graphs. Lew Skannen, as far as I know, the errors that the NCDC provides are statistical “standard errors”. They do not list measurement errors, uncertainties due to incomplete sampling, etc. Pingback: Finally Some Reality from RealClimate – But, Unfortunately, They Remained Unreal about Some Things | Watts Up With That?